Sandeep Aggarwal is an angel investor, serial entrepreneur, philanthropist and Internet visionary. 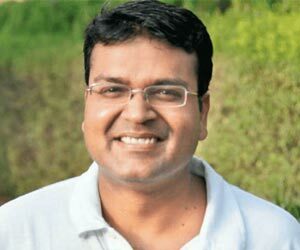 He is the founder of two marketplaces in India- Droom, India’s first automobile marketplace and ShopClues, India’s first and largest managed marketplace and is also CEO of the former. In April 2014, Sandeep, started Droom which is a completely disruptive business that is creating unpanelled trust and pricing advantage for buyers. Prior to Droom, Sandeep founded ShopClues.com, India’s first and largest managed marketplace in his house in California in late 2010 and moved to India to launch it as India’s first managed marketplace to empower 15 million SME sellers and unstructured categories e.g. fashion, home/kitchen etc. online. Sandeep founded ShopClues in an era when all the other E-Commerce companies in India were inventory-led models. In 3 years, ShopClues rose from 35th entrant into Indian E-Commerce to become the 4th largest E-Commerce company with 50 million monthly visitors and close to $500milion in annual GMV. Entrepreneurship comes naturally to him but he is always on a look out to support out-of-the box ideas and promising ventures as an angel investor. He has already invested in Shopsity (An anti-e-Commerce site), Poolmyride (Cab sharing start up) and AYN Network (B2B Marketplace). Sandeep looks for attributes similar to his – high energy, passion and long-term vision while investing in new ventures. He believes technology plays an extremely pivotal role in creating winning ventures, and supports founders who believe in frugality and economic effort as a means to achieve success. With 17 years of global experience in business operations, strategy and investment, focusing on Internet and technology, Sandeep is counted amongst leading Internet experts globally, and has regularly appeared on CNBC, Fox, ABC News and regularly quoted by Wall Street Journal, Fortune, Forbes and other prominent media outlets. Prior to his two ventures, Sandeep was amongst the most renowned Internet analysts on Wall Street based out of Silicon Valley, providing research coverage on Google, Yahoo!, eBay, Amazon, Netflix, Priceline, Microsoft, MakeyMyTrip etc. He has also worked in strategy roles at Microsoft in Seattle and Schwab.com in San Francisco. With an MBA from Washington University in St. Louise, USA, Sandeep is chartered member of TiE Silicon Valley and also holds one US patent.